I gave myself A+ for patience and effort as I scooped these little purses out from the hot oil. I am amazed by the amount of time and effort involved now that I try to document this recipe. I lost count of the number of hours that went into creating this dish. I have painstakingly chopped everything by hand to make sure it preserves the distinctive texture of each ingredient. 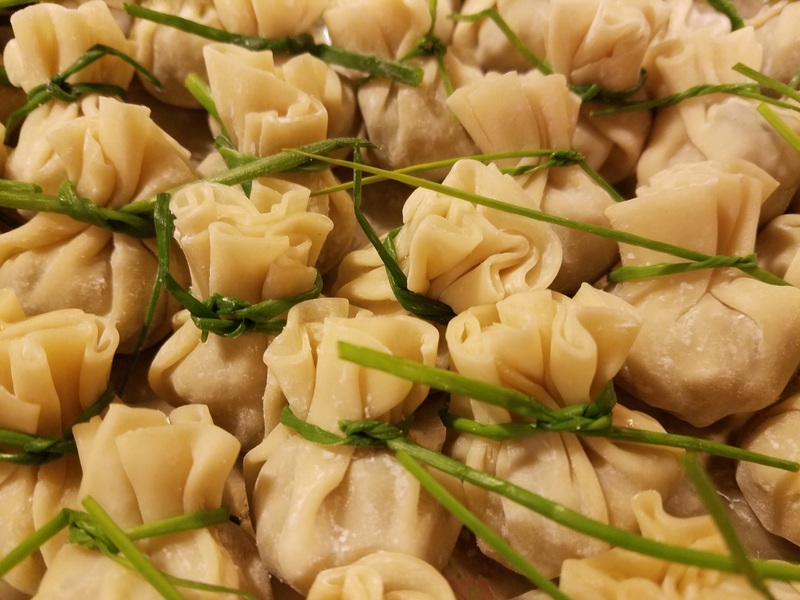 It also took me a good 2 hours to put a bow on every dumpling with fresh chives. Cooking is therapeutic for me; taking the time to make sure the food looks good, smells good, and tastes good makes me happy. 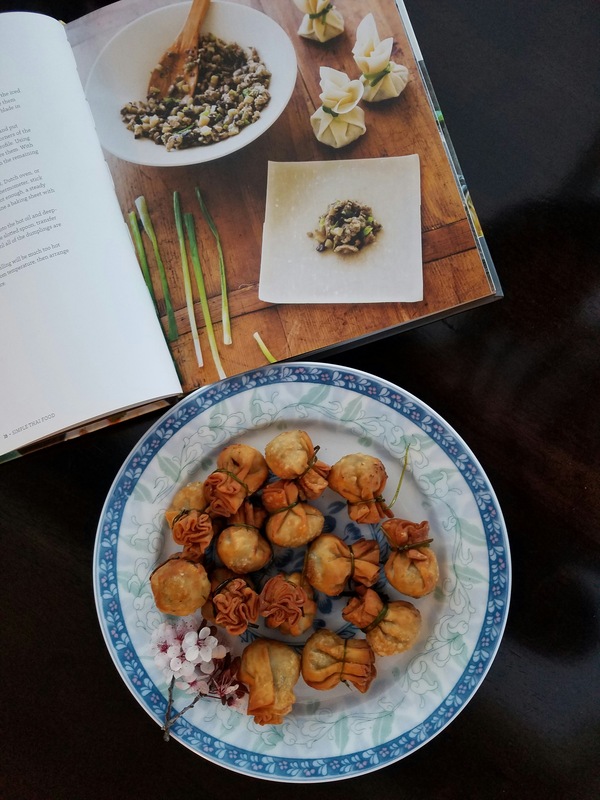 Thank you Hanna for the gift of the Simple Thai Food cook book. I do have a lot of fun trying out the recipes. Note: I made this first attempt with pot sticker skin (I happen to have a pack leftover). Pot sticker skin is probably a little too thick and small for this recipe. I think it will be much faster to use thinner wonton skin, and even faster to use bigger spring rolls skin 🙂 Thinner, bigger, means fewer, and faster! 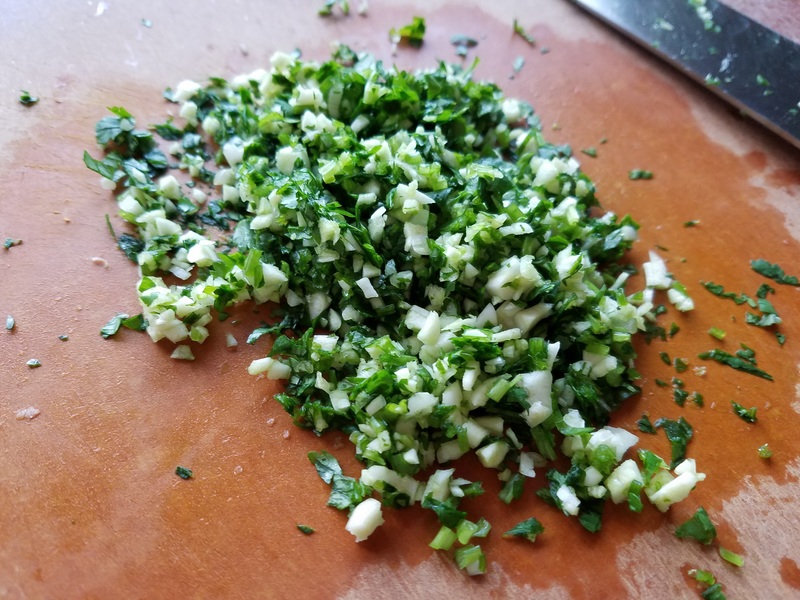 Chop or pound the garlic, ground pepper, and cilantro into a fine paste. Heat oil in a wok over medium high heat. Add the garlic/cilantro paste and stir fry for a minute until fragrant. Turn up heat. Add the chopped green onions and mushrooms and stir fry for another 2 minutes until onions and mushrooms have softened. 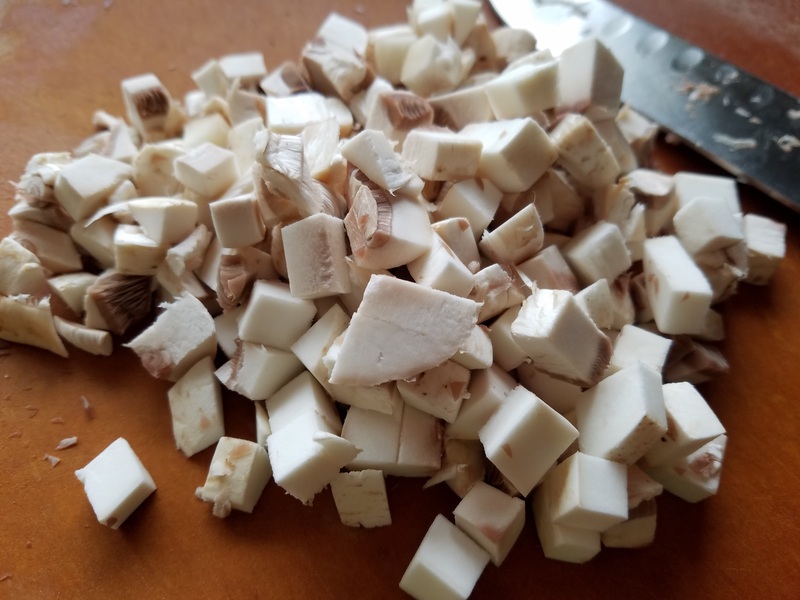 Add the ground chicken, soy sauce, oyster sauce, fish sauce, sugar, and water chestnuts and stir fry with two spatulas, breaking up the chicken finely. Fry for 5-8 minutes until the chicken is cooked through and liquid has evaporated. The filling should not be wet, but not dry either. Cool the filling completely before wrapping the dumplings. 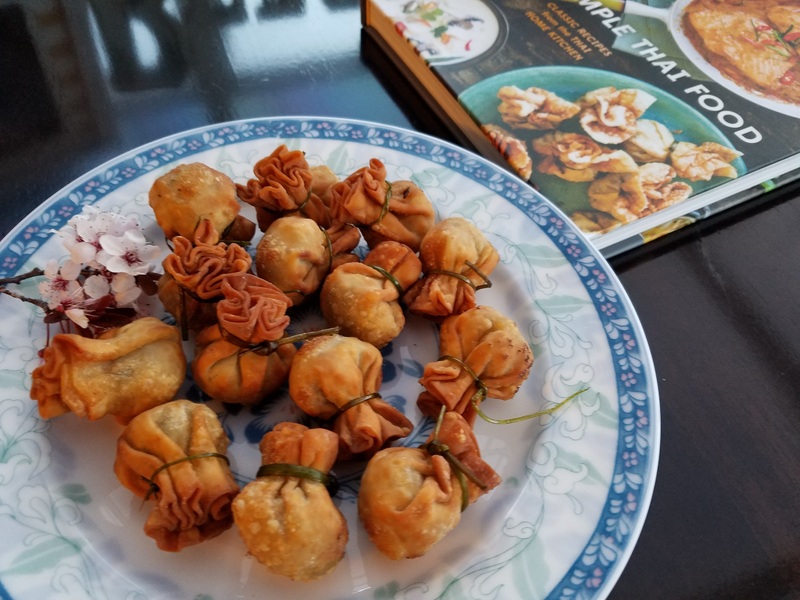 Fill each wonton skin with about 1 Tbsp of filling. Dip your finger in a shallow dish of water and wet the skin around the filling. Pinch the skin together and shape the dumpling in the form of a purse. 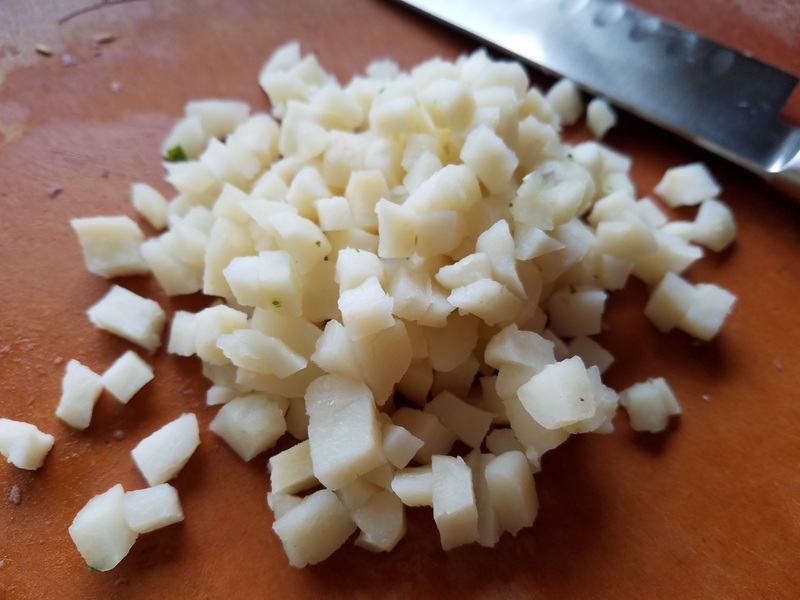 Tie a chive around the gathered edges with a knot. This takes time and patience! Arrange each dumpling neatly on a tray so that they do not touch each other. 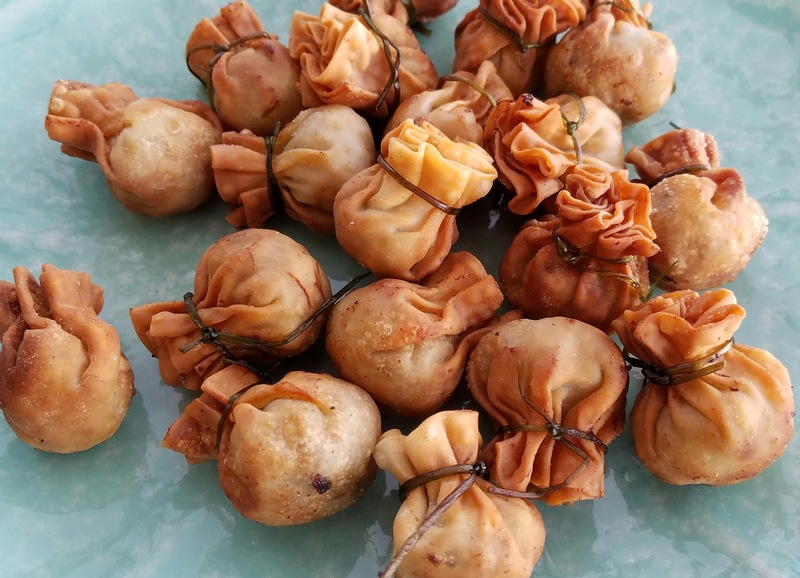 If you are not ready to fry the dumplings, you can freeze them. Heat oil for deep frying in a pot until a wooden chopstick inserted has bubbles running up the chopstick briskly. Add the dumplings in small batches and deep fry until golden brown. Serve hot with sweet Thai chilli sauce.